Note: plug-in building for hosts other than Ableton Live is no longer supported. For more information to help you make the transition to creating plug-ins in Max for Live, see Max for Live for Pluggo Developers. plugmod allows a plug-in to modify the parameter values of another plug-in. It generates a pop-up menu listing all the visible parameters of all currently loaded plug-ins. The output of this menu is fed back to the input of the object to tell it what parameter should be modified with the numeric input plugmod receives. Additional inlets and outlets interface with pp objects to save the object's connection to a particular plug-in and parameter in effect presets. This allows plugmod to reconnect to its target plug-in and parameter when a sequencer document is reloaded. In left inlet: The value received, which is constrained between 0 and 1, is assigned to the target plug-in and parameter. In 2nd inlet: The value received is added to the base value of the parameter before plugmod begins to modify it. In 3rd inlet: The value received is multiplied by the base value of the parameter before plugmod begins to modify it. In 4th inlet: The value is interpreted as a code to assign a new plug-in as a target. The outlet of a pp object is normally connected to this inlet. In right inlet: The value is interpreted as a code to assign a new parameter as a target. The outlet of a pp object is normally connected to this inlet. 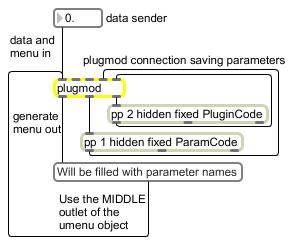 In left inlet: A plug-in name followed by a parameter index sets the parameter the plugmod object will modify with its numeric input. This plugin and parameter are referred to as the object's target. Note: When the word No Connection is received, the plugmod object breaks its connection (if any) with its current target and stops affecting the target parameter. The No Connection symbol is always the first item in the menu generated by the plugmod object's left outlet when plug-ins are inserted or deleted in the runtime environment. anything: Out left outlet: Output from this outlet of the plugmod object occurs when a new plug-in is either inserted or deleted. The messages update an attached umenu object with a new list of plug-ins and parameters that are potential targets for this object to modify. float: Out 2nd outlet: The current plug-in code is output when the object's target changes via a message from the attached pop-up menu object sent to the object's left inlet, or when a new plug-in code is received in the 4th inlet. Out right outlet: The current parameter code is output when the object's target changes via a message from the attached pop-up menu object sent to the object's left inlet, or when a new parameter code is received in the right inlet.